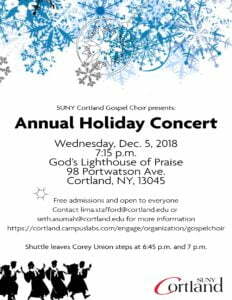 CORTLAND, N.Y. — The SUNY Cortland Gospel Choir and the Africana Studies Department at SUNY Cortland will hold their annual holiday concert on Wed., Dec. 5, at 7:15 p.m. at God's Lighthouse of Praise, located at 98 Port Watson St., Cortland. The holiday concert will celebrate the end of the academic semester. Admission is free and the concert is open to the entire Cortland community. A bus shuttle will depart from the steps of Corey Union at 6:45 p.m.
For more information, contact lima.stafford@cortland.edu or seth.asumah@cortland.edu.